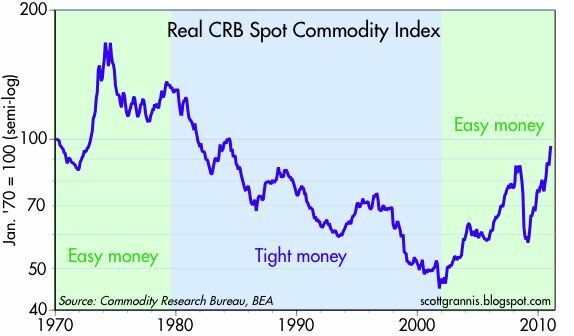 To make things more interesting, on the second chart I have added some colored backgrounds to highlight how different monetary policy regimes have impacted real commodity prices. Monetary policy was notoriously easy in the 1970s. Money was cheap to borrow (real interest rates were generally low), so speculators had a field day buying and hoarding commodities, and selling the dollar. Beginning in late 1979, when Paul Volcker took over the Fed, monetary policy shifted to inflation-fighting mode and ignored any signs of economic weakness. Real interest rates were generally high for the next two decades, and inflation fell from double digits to a mere 2%. Speculators had a hard time surviving those years, since commodity prices went nowhere but borrowing costs were high. Unable to speculate on inflation-fueled price rises, investors were forced to make money the old-fashioned way by buying and creating productive assets. Since 2002 we have seen the Fed shift to an overtly accommodative monetary policy stance. Real borrowing costs have been generally low, speculators have thrived, the dollar has again collapsed, and commodity prices have soared. The parallels between the 1970s and the past 8 years are many: a weak dollar, soaring commodity, gold, and energy prices, real interest rates that are generally low, and a Fed pays more attention to the economy than it does to sensitive asset prices. The only thing that makes the period since 2002 different from the 1970s is that inflation hasn't risen in recent years (although the CPI did rise to 5.6% in mid-2008). Will we continue to see very low inflation? I sincerely doubt it. History may not repeat itself exactly, but there is sure a lot of rhymin' going on. 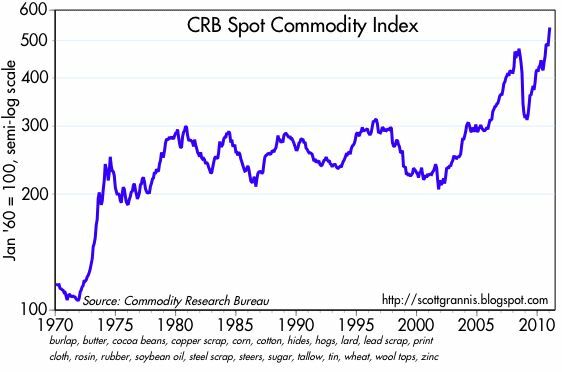 Question: How does inflation adjusted commodity prices compare to commodity prices adjusted for the degradation of the dollar (ie money printing) since the 60's? I imagine there was more of a connection between US monetary policy and commodities prices in the 1970s than today. My understanding is that China has become the largest buyer of many commodities, and they have been aggressively expanding their supply of money, and growing their GDP at about a 10 percent clip. If China (and India, Brazil, Russia, Thailand, Korea) is causing global commodity boom, should we put a monetary noose around our necks? I wonder about inflation in the USA. If what Scott Grannis says is true, that the Fed has been loose since 2000, then where is the inflation? By some measures, we are in deflation now (the CPI, say FOMC staffers and board members, overstates inflation by about one percent. That puts us nearly in deflation now). It could be that today, thanks to wide-open borders, we have a new world in the USA: Strond demand just leads to strong growth, and little inflation-especially when coming out of the deepest recession since the Great Depression. Think about it: Goods, capital, labor and services easily pour into the USA. When there was strong demand for labor (the Clinton days), Latin Americans workers showed up. Strong demand for cars, means huge imports of cars--the market does not allow for much rent. Indian call centers are an example of services crossing our border (or labor, in a way). There is a global capital glut, meaning if a US manufacturer or distributor wants to increase plant and equipment, they can, and the money is cheap. Capital crosses borders at the speed of light. If there are not too many governmental structural impediments, then in a wide-open economy like the USA, strong demand creates strong growth, and little inflation. I think our open border policy is a huge success. You need a microscope to see inflation today, and a telecope to see any coming. It really rankles me that California has been subsidizing the federal government to the tune of about $50 billion a year for decades. We pay far more in federal taxes than the state gets back in outlays. This is, of course, due in large part to the Red State Socialist Empire. Rural red states make out like bandits in a lard-house, diverting federal revenues into their states (it helps that rural states have two Senators each, and thus outnumber Senators from large high-income states). If CA had not subsidized rural America for the last 30 years, we would have plenty of dough to run our state (even badly, as we do). I have long contended a great solution to the federal deficit is an amendment that each state get back roughly what they send to DC. This would balance the budget, and end the parasite status of rural America. Benjamin wrote: "You need a microscope to see inflation today, and a telecope to see any coming." It does help to open one's eyes at the grocery store and gas filling station. The FOMC may "say" that the CPI understates inflation by 1% but others, including Jim Rogers, say that it understates inflation. The US Treasury has a vested interest in the construction of the CPI (it was modified in the 1980s) since Social Security and other payments are tied to it. It is to the US government's advantage to understate inflation. Some serious people have looked the problem of accurately measuring inflation, an issue fraught with some non-soluble issues. Better-quality good and services, and new goods and services, play havor even with the most balanced approaches. Housing costs seem to thwart the best of intentions. In my neighborhood of Los Angeles, dollar-stores have become common. I get items for $1 that I used to buy for $3 or more, many years ago. Is that deflation? The shopping experience is not exactly royal. I just bought several reading glasses for $1 each. My guess is that starting a business up in Los Angeles is much cheaper today than five years ago, due to lower rents, labor, and better services, such as cell phones and Internet connections. With a laptop and cell, you don't need that standby of yesteryear--the secretary. Some pretty conservative fellows, such as Michael Boskin of Stanford, and the FOMC guys, have come to the conclusion that the CPI overstates inflation. The FOMC is not really part of the federal government, and even if it was, central bankers are usually inflation-phobiacs. Yes, food and gasoline are up. Housing and rents are down. Clothes are way down, over the years. I suspect fast food is cheaper than ever, though I may not advise too many $1 burgers. Sometimes people complain about the cost of living, but say they are complaining about inflation. The concepts get conflated. The best indicators we have are the CPI or the personal consumption deflator. Thanks to wide-open US borders, and declining unit labor costs, general price inflation in the USA is dead for many years to come.